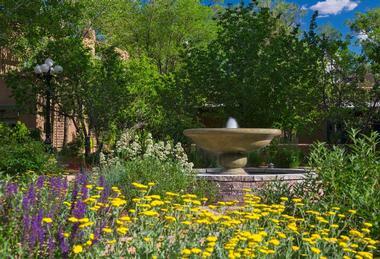 Santa Fe, New Mexico, high in the Sangre de Cristo Mountains, is the setting for the historic La Posada de Santa Fe. On six acres in downtown Santa Fe, La Posada’s twenty-six buildings are a step back in time and a step forward in comfort and luxury. The hotel began in 1882, when wealthy merchant Abraham Staab built a three-story brick mansion for his wife Julia and their growing family. The original home, still standing and used as one of the hotel’s restaurants, was built in brick and decorated in fine European-style. After the death of Abraham Staab, the house changed hands; it was in the early 1930s when the home and property were acquired by the Nason family, who envisioned an artist’s colony. Southwestern casitas – little houses – were built on the grounds, and the name La Posada, meaning “inn,” was given to it. It flourished for two decades as a home for artists, and a summer arts school was established. In the 1990s, the time-worn building and property were renovated fully and a spa, a conference center and more guest rooms were built and decorated with southwestern flair. As much as possible, original floors, ceilings and adobe walls were kept, so that the inn of today truly has a taste of yesterday. The inn’s grounds are dotted with fruit trees and beautiful gardens. 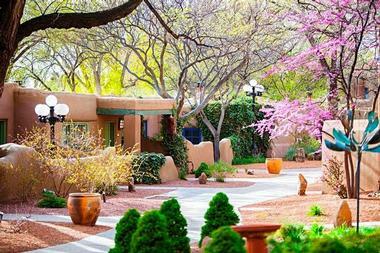 La Posada de Santa Fe is pet-friendly and prides itself on its green initiatives. 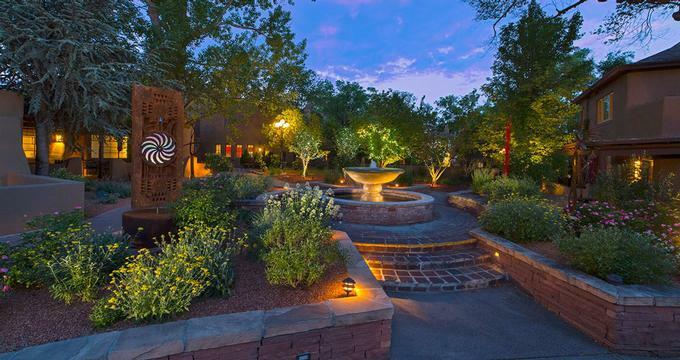 La Posada de Santa Fe has 157 rooms and suites in both casita and traditional hotel settings. All rooms are decorated with southwestern motifs and many rooms have original adobe walls, hardwood flooring and exposed ceiling beams. 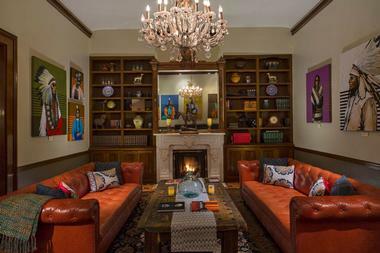 Furnishings are bought locally and the inn’s rooms showcase the talent of New Mexican artists. All the rooms and suites of the hotel have high-speed Internet, bottled water to help adjust to the altitude of the city, flat screen televisions, plush robes, spa toiletries, in-room coffee and tea makers, and bathrooms with luxurious brown granite countertops. Guest rooms also have hair dryers, irons and ironing boards, a complimentary daily newspaper, a mini-bar and dual-line phones with free local calling. Plush beds are topped with 100% cotton sateen bedding and fine duvets. The Cozy Artist Studio Rooms are set in the casitas of the former artist’s colony. These small, comfortable guestrooms have a double or queen bed, adobe walls, views of the hotel gardens, and are decorated in tranquil earth tones. Superior Rooms are larger than the Cozy Artist Studios and have queen or king beds. There are several Superior Rooms on the main floor that are outfitted for guests with disabilities, all of which have roll-in showers. La Posada’s Deluxe Rooms have wood or gas fireplaces and either a balcony or a patio. Deluxe Spa Rooms are located near the hotel’s spa and have furnished balconies, high-beamed ceilings, richly patterned carpeting and a king bed. The Deluxe Spa Rooms also have oversized bathrooms with a tub and separate shower. La Posada’s Superior Suites have separate living and sleeping areas. Casita-style, these suites have original adobe walls and wood-beamed ceilings. The comfortable living area is rich with southwestern motifs and is furnished with a sofa, a coffee table and a mini-fridge. Deluxe Suites have exceptional garden views, a balcony or patio and a wood or gas fireplace. Two-Bedroom Suites have a master bedroom with a queen or king bed, and a second bedroom with a queen bed. Each bedroom has a flat-screen TV, and the living area contains a sofa, a coffee table, a credenza, a work desk and a mini-fridge. The Deluxe Spa Suites are located near the hotel’s spa. Richly carpeted, with furnished balconies, these suites have armchairs, a sofa, a coffee table, a work desk and a king-sized bed. 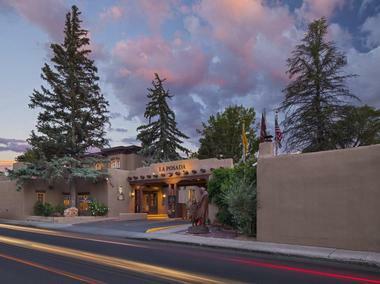 The Baca Suite is La Posada de Santa Fe’s premier accommodation. This beautiful suite has traditional adobe walls, a well-furnished patio, a large living room and a reception area, making the suite perfect for entertaining. Three wood-burning kiva fireplaces and flagstone flooring add to the authenticity of this southwestern room. Double glass doors lead from the living room to the patio, which is furnished with two tables, comfortable chairs and a broad wood bench. The suite’s bedroom has a king-sized bed, and the rest of the suite has leather seating, a table for four and exquisitely designed throw rugs here and there on the flagstone flooring. More ideas: Romantic Santa Fe Hotels & Inns. A Spirited Restaurant and Bar, named for Julia Staab, the wife of the merchant who built the original mansion. Legend tells that Mrs. Staab loved her home so much that she never left it, and many travelers claim to have encountered her ghost. The elegant Santa Fe socialite would have been charmed by the elegant restaurant in her name and would have enjoyed the refined menu, the adventurous food pairings and the perfectly plated presentations. The Staab House Restaurant is located in the original Staab mansion. It features signature cocktails, stand-out bar food and fireside seating. On Friday nights, guests can enjoy live Latin jazz. The Patio Restaurant offers a chance to dine al fresco under the sun or stars. Fresh and innovative cuisine is served here. 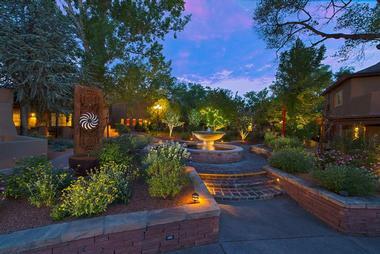 The Spa Sage is La Posada de Santa Fe’s in-house spa. Refined, luxurious and elegant, the spa focuses on holistic health and wellness, and offers spa treatments and a full-service salon. Traditional services are available, as well as treatments unique to The Spa Sage. Julia Staab’s Historic Rose Garden treatment nods to Mrs. Staab’s passionate love of roses. The treatment includes a rose oil scrub, a rose hydrotherapy soak and a rose oil massage. The best of the southwest is combined in The Spirit of Santa Fe, which begins with a blue corn exfoliation and features a full body massage with desert sage essential oil. Chocolate lovers will find all they are looking for with the Santa Fe Chocolate Chili Wrap, which envelops the body with a potion made of Chimayo red chilies, chocolate and marine algae. A chocolate and cocoa butter massage follows the wrap and leaves the body delightfully pampered and soft. The Altitude Adjustment Massage is perfect for guests feeling under the weather because of Santa Fe’s location seven thousand feet above sea level. Chlorophyll elixir and oxygen treatment refreshes the body at the cellular level, and a dry brush exfoliation and massage awaken the senses and relieves headaches caused by the altitude. In addition to these signature services, the spa offers traditional Swedish massage, with its gentle and flowing strokes; Deep Tissue massages to relieve pain and soothe stressed muscles; River Stone treatments to assuage tired and overworked bodies; Aromatherapy massages to awaken the senses; and Maternity massages to nurture moms-to-be. Thai massages use a limb-stretching technique to alleviate pain and stress in the muscles, and are performed here with a delightful lemongrass and coconut oil. Back, neck and shoulder massages are also offered by The Spa Sage. The High Desert Anti-Aging Facial is a much-loved treatment for the face, neck and décolleté. This facial really does it all: It cleanses, extracts impurities, uses anti-aging serums, peels and microdermabrasion, utilizes a hydrating mask and finishes with LED therapy to boost collagen growth. The Natural Lift Organic Facial revitalizes aging skin by cleansing, steaming, extracting impurities and by use of ultrasonic removal of fine lines. The Vit C Brightening Facial reverses sun damage and the signs of aging with potent anti-oxidants, correcting botanical extracts and Vitamin C serum to reduce wrinkles. The Non Crystal Microderm Dermal Quench replenishes skin at the cellular level with bio-active serums, exfoliates and soothes and rehydrates with a black currant oil face massage. The salon at The Spa Sage offers a full array of hair treatments, manicures and pedicures, non-wax hair removal and makeup application. La Posada de Santa Fe has an excellent fitness facility containing free weights and cardio equipment including elliptical machines, treadmills and stationary bikes. The fitness facility has locker rooms, which provide robes and slippers. On weekends, guests can take yoga classes and personal training and private yoga classes are available upon request from qualified fitness instructors. The hotel has a heated outdoor salt-water pool and a saline hot tub. Hungry swimmers will enjoy the Poolside Grill and its menu of sandwiches, salads and beverages. Near the pool is the Lavender Steam Room and a relaxation lounge. Within the hotel’s walls is a professionally-curated gallery of southwestern art. Guests on weekdays can take part in tastings of margaritas and tequilas, join in a wine and cheese or a beer and cheese social or enjoy s’mores by the fire. History talks are given weekly, with varied subject matter. Whether it’s an intimate family gathering or a lavish two-hundred guest affair, weddings at La Posada de Santa Fe are the best in the city. The hotel’s event planning team offers assistance with every detail of the special day, and the catering staff have a full and varied menu from which a luxurious banquet can be designed. The Montana ballroom, with its fireside splendor, is a popular choice, but large weddings can also be held outdoors in the sunlight or under the glow of the stars. The hotel salon offers hair and makeup treatment for the bride and her party. La Posada de Santa Fe keeps Mexican wedding traditions alive with Conchita, the wedding donkey, a gentle creature whose specially-designed saddle holds the ingredients for tequila shots, with lime and salt. La Posada de Santa Fe offers 4,500 square feet of flexible meeting space and event planners to ensure that corporate gatherings run smoothly and with attention to detail. Up to two hundred people can be seated in the facilities of the hotel, and outdoor and indoor venues are available. La Posada can provide everything from a grand ballroom and boardrooms to historic rooms, such as the Staab mansion library and salon, which are also available for business meetings. The hotel has sophisticated audio-visual services, high-speed Internet, a business center and tech specialists. Back to: Luxury Weekend Trips in the U.S. and Things to Do in Santa Fe.